Steve Johnson is a radio show presenter who has been a broadcaster on many stations in South Wales. I thought I would interview Steve Johnson and I will tell you why. Steve has been a very good friend of mine for many years. We were both part of the South Wales rock music world and used to hang out at the same venues. So as you will have gathered by now, Steve is a musician too and so we shared a common creative drive and interest. Steve became a radio presenter and hosted shows on Red Dragon FM, Radio Wales, Bridge FM, and Valleys Radio. More recently he has worked for Radio Cardiff. 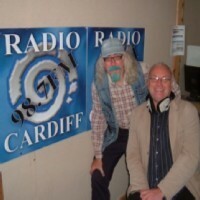 I have been a guest on his shows on all these local radio stations in South Wales. Steve also teaches radio broadcasting and presenting and ended up as my tutor when I was doing a Media Studies course in 1997. I am Steve Johnson, radio presenter, raconteur and frustrated musician. I have worked in and around the radio industry for 22 years. I wish the industry would realise what a "USP" actually is and try to realise that potential. In your career as a radio broadcaster and DJ what have been some memorable moments? I have always loved meeting and interviewing people, sometimes rich and famous, sometimes not. Notable moments would be engaging in badinage with John Lydon, chatting up Belinda Carlisle in her hotel room, talking to the Cure at the Manor recording studios and watching King Arthur thumb a lift in Abergavenny! What do you think makes a good radio show? Spontaneity, imagination and stepping out of the box to show your real personality. What do you think of radio as it is today? It is essentially a sitting duck, rotting away as it floats downstream. Capitalism eventually must eat itself and that is personified in the pathetic way that ILR dives into the world of voice tracking and syndication, ignoring the actual wishes and desires of its audience. Alternative TV is huge, so why not radio? Would you like to share any experiences in the world of music either as a performer yourself or with other acts? I was born into the wrong environment at the wrong time. When I was trying to get signed it was an embarrassment to be Welsh, now it is a badge of honour. I’d gladly have given up my time in radio, Red Dragon FM et al for a couple of tours with a half decent band. Please say a bit about your current work? I am currently employed by the University of Glamorgan as the Community Radio Tutor. I teach under grads on several degree courses. I have also written a couple of community radio modules which are delivered at various radio stations in Wales. I am looking to finally study for my M.A (Res) this year. What is the Loose Goose show all about? It is an alternative radio show for adults. It is not genre specific, it fluctuates from style to style. It is my firmly held belief that the love of music is a lifelong pursuit. We don't suddenly stop listening as soon as we leave puberty as radio conglomerates would love us to believe! As John Peel (radio God) put it: "no-one wants to listen to their private record collection for the rest of their lives". It is an eclectic, irreverent homage to the beauty of music, past and present. It is all inclusive rather than exclusive and is delivered with a large dose of humour. Name some famous people you have interviewed or had on any of your radio shows as guests? Squeeze, The Blockheads, The Cure, The Wonder Stuff, Manic Street Preachers, Gorky’s Zygotic Mynci, Super furry Animals, Midge Ure, The Alarm, Belinda Carlisle, Johnny Rotten, The Christians and the Legendary Steve Andrews. I have the pleasure of working with the extremely talented Ed Parnell as my "Executive Producer" (part time petrol pump attendant) and JR the Radio Star as my co-host, Merthyr's finest exponent of mayhem and music knowledge. The show goes to air on Gtfm 107.9 (www.gtfm.co.uk) on the first Thursday of each month from 10 pm to midnight GMT. We also appear on all of the usual social networking sites. 95% of the big names I interviewed were fantastic in real life. I reserve judgement on Blur and Crowded House. 1994 dark masterpiece finally available on high quality black vinyl, on its own. Contains "She Is Suffering" and "Faster"
Yes, Steve would have been ideal as the DJ for your wedding! Thanks for posting! Top man, top DJ! We had the honour of having him DJ at our wedding- made a wonderful day perfect. Oh and top singer/songwriter too! Known as the Bard of Ely and Green Bard now years ago I was the Legendary Steve Andrews or just The Legend.